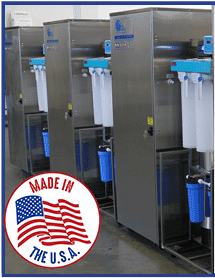 The C-50 commercial water distiller provides distilled water for hospitals, schools, restaurants, factories, laboratories, printing companies and more. 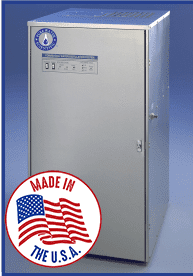 The C-50 commercial water distiller provides high-quality steam distilled water for commercial, industrial, and institutional applications. 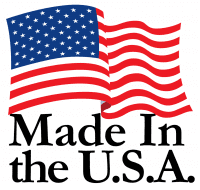 For more than 45 years the Pure Water brand of distillers has been in daily use. 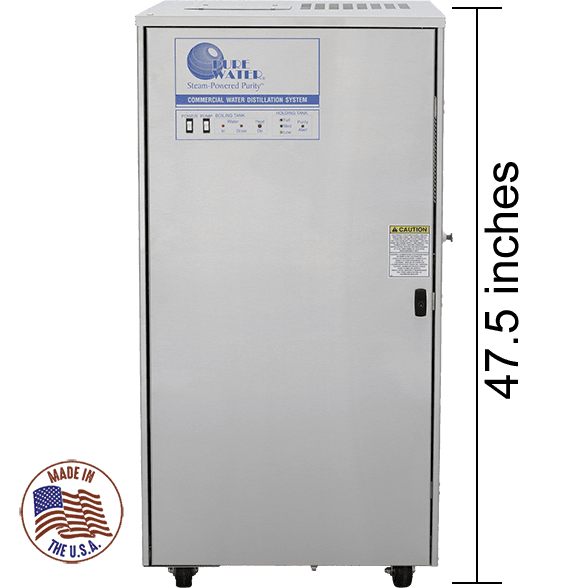 This unit is used in laboratories, hospitals, and offices throughout the U.S.A. and in more than 120 countries around the world. Applications: Drinking Water & More! 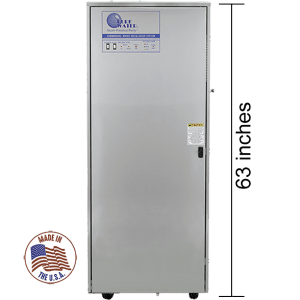 Steam-distillation is so effective, that in severe water emergencies, the Federal Emergency Management Agency (FEMA), the American Red Cross and the American Water Works Association (AWWA) recommend using a distiller to purify drinking water. They do not recommend filters or reverse osmosis. Every day Mother Nature is turning salty ocean water into fresh and pure rainwater through a process of evaporation and precipitation. This is the basis for the steam-distillation process. 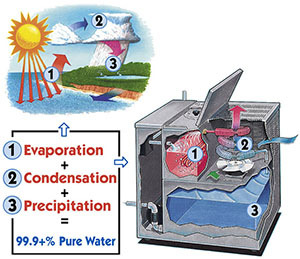 It is as simple as A, B, C.
Just as Mother Nature takes ocean water and makes pure, rainwater, the C-50 Commercial Water Distiller duplicates the Hydrologic Cycle inside this appliance. 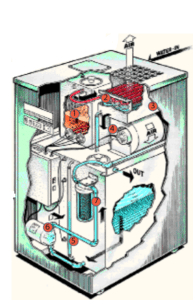 Raw water enters the Boiling Chamber where it is heated. 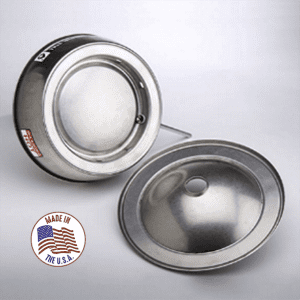 Use as a stand-alone product for an individual end use or install as a network to deliver pure steam-distilled water to a variety of locations. 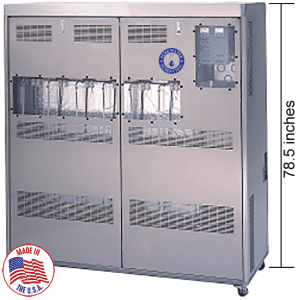 The C-50 is fully self-contained with generous storage. These are complete standalone air-cooled distillation systems with self-contained storage. The steam-distilled water produced undergoes constant purity monitoring with automatic shut-down to ensure a great end-product. Both units are constructed of heavy-gauge T-304 stainless steel throughout and have a lockable cabinet for security. 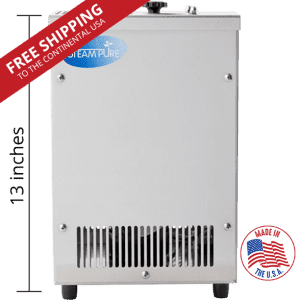 The C-50 produces up to 50 gallons per day and has a builtin 50-gallon stainless steel storage tank. 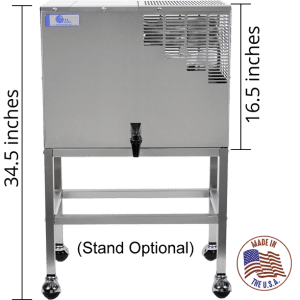 The C-60 produces up to 60 gallons per day with a 60-gallon stainless steel storage tank and additional features. Installation is very easy and maintenance is low. 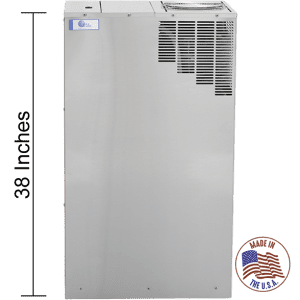 The unit is covered by a one-year limited warranty. A full range of accessories and parts for the C-50 Commercial Water Distiller are available. 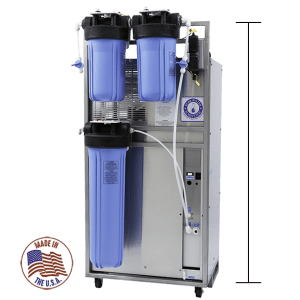 A partial list includes softeners; activated carbon filters; pumps; dispenser with and without ultraviolet; universal hook-up kit; tubing; fittings; and individual parts for the unit.